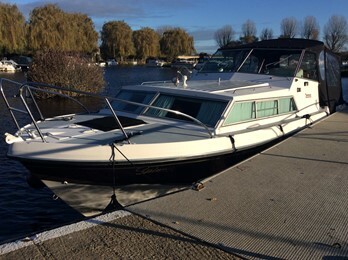 &nbsp;This tidy Wide beam Norman&nbsp; is an ideal family river cruiser. Large cockpit and spacious saloon. Custom built Norman 23, "Cedarwood"
This Norman 23 was custom built by Westview Marina Earith. This is a practical river canal cruiser. 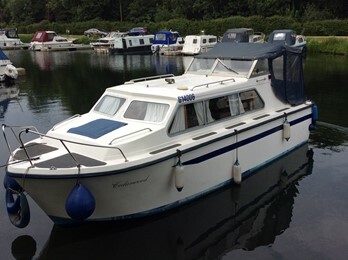 Norman Cruisers of Shaw, Lancashire were a prolific designer of inland cruisers, building a total of 7000 craft. The company founded in the late 1950s went into GRP production in the mid 1960s, starting with the Norman 17. The majority of craft were outboard powered and narrow beamed to allow canal cruising. At the height of the business between 1971 and 1973 Norman employed 200 people and made as many as 25 boats in one week. This made them one of the largest boatbuilders in the UK at the time. The company traded until 1979 (the winter of discontent) and then re started in 1980. In 1982 a devastating fire damaged most of the mouldings and the company never really recovered from that. Towards the end of their company life Norman went into larger wide beam cruisers with the 266 model.